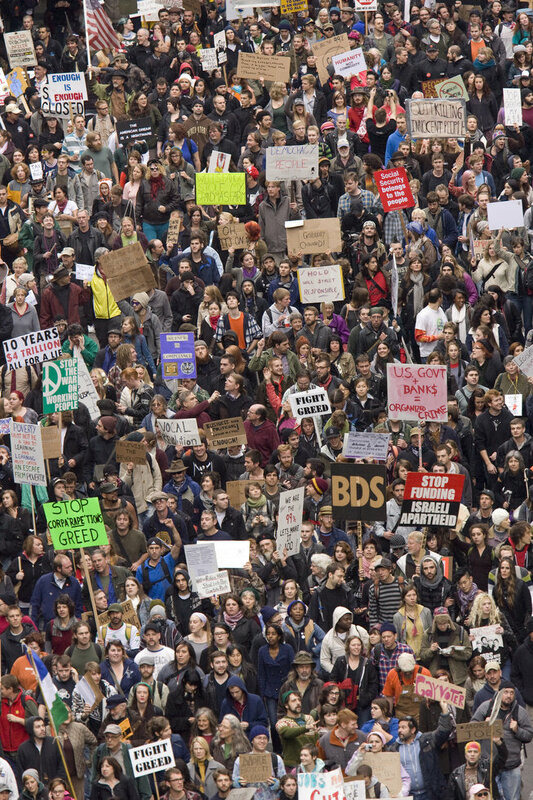 In this exclusive article for the US Campaign’s blog, Steering Committee member Peter Miller shares his thoughts on organizing to end military aid to Israel at Occupy Portland. Download the template flyer that Peter mentions in his article for the Occupy events in your city. Sign up to get an organizing packet to end military aid to Israel from the US Campaign. The Occupy Wall Street movement is one of those moments of spontaneous flourishing of new grassroots energies, powered by new media and young people. At root, it asks for economic justice and accountability of financial institutions that so obviously have failed. By doing so, it also holds government responsible alongside corporations for making accountability and the rule of law stand for something in order to have a government truly by and for the people. Those of us working for Palestinian rights know the tremendous harm U.S. policies have done for the prospect of justice for Palestinians and for peace in Israel and Palestine. We know that the $3 billion in military aid we send to Israel every year feeds our military industrial machine and allows Israel to use military force with impunity to deny Palestinians their basic human rights and make them deeply insecure physically and economically. This money destroys even our good works as Israel uses the weapons we provide to destroy Palestinian infrastructure like homes, schools, hospitals, and public works that frequently we have also paid for, making the Palestinians highly dependent on aid and unable to have a normal economy to provide living jobs and a future. Occupy Wall Street and the various occupy actions around the country are an opportunity to make our fellow citizens aware of the deeply counter productive and unjust use of our tax dollars, money that could and should be spent here at home instead of feeding injustice abroad. People are eager for information about the issues and problems that helped get us into this economic and socially unjust mess, as well as solutions to questions which certainly should include: how can we fund a democracy that cares for its citizens? And what should we spend our treasure on now? The US Campaign to End the Israeli Occupation has an excellent web site that can help you address this critical economic issue, aidtoisrael.org With this tool, you can determine how much of your federal tax dollars goes from your state, county, and congressional district to feed Israel’s military habit. Here in Portland, we took our numbers for Oregon and Multnomah County to show people at Occupy Portland the grotesque use of our tax dollars. You could also replace the county numbers for those of a congressional district. We handed out 400 flyers with the aidtoisrael.org data and got a very receptive response. We also had a number of signs in red and black which said “Stop Funding Israeli Apartheid” on one side and “BDS” on the other. These two sides managed to get on the front page of our paper, The Oregonian, when it covered the Occupy Portland event. We are proud to say that the Occupy Portland protest that day included many as 10,000 people. A number of folks asked what BDS meant, which gave us an excellent opportunity to education people about Boycott, Divestment, and Sanctions and what it means applied to Israel.